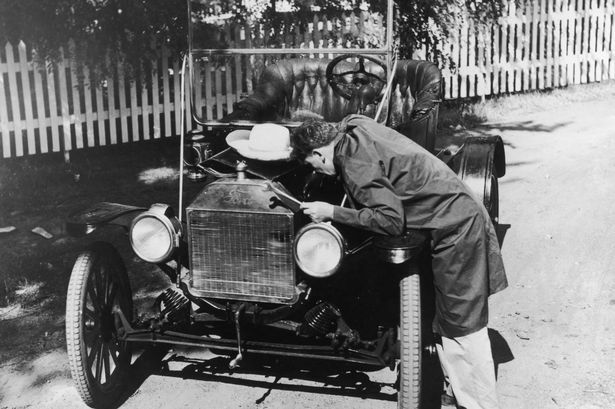 Model T Ford Forum: Old Photo - Pesky Waterpump! Old Photo - Pesky Waterpump! Model T Ford Forum: Forum 2014: Old Photo - Pesky Waterpump! One of my favorite cars, a 1912 torpedo roadster (I slightly prefer the 1911 version). He is holding a spark plug wrench. But I usually work on the plugs from the other side? Now. Something about that photo bothers me (let the debate begin!). I am not sure exactly what it is, but it has to do with the photo itself. I think it may be called the "depth of field" (Steve J?). Also the gray scale. I don't see anything in the picture that cannot be there in the mid'10s. Headlamp electrification kits were available by 1912. Hassler shock absorbers were available in 1914. That type non-skid tire tread may not have been the most common then, but was readily available by 1915. The man's shop coat is suspect but similar to era dusters. His trouser leg style and color are also suspect, but possible for the car's era. The car's cleanliness in general is out of the ordinary for the '10s. That coupled with the shiny but old looking rear fender all make me think that the photo may have been taken in the '50s or '60s. I see one other detail on the car that makes me think it is an antique car hobby photo. Anybody else see it? Great photo, regardless! Thank you Jay. That car has no top. Wayne - Seems like if this photo were taken "back in the day", the top would not be missing,.....and I don't see a top folded back in this photo. Also, the planetary steering gear case should be brass, and in this photo, it does not appear to be brass. Now then,.....here's a really "weird" one! And this is sort of like the man-in-the-moon thing,.....some can see the man-in-the moon, and some cannot. This must be some sort of optical illusion or something due to the tree leaves. If you don't look too hard, it looks like the image of a woman's face, just above the steering wheel, and looking to her right and slightly upward, maybe talking on a phone which she is holding up to her left ear. What looks to me like her dark or black hair must be just the way the tree leaves look. (???) Yeah, I know,.....weird! But like I say, some DO see the man-in-the-moon, and some never see it! Brian - Ref the missing top, we were typing at the same time, but I'm slower! Harold, I see her too. Looks like Judy Garland to me. And you're not necessarily slow, you had a lot more typing to do. I can clearly see the lady on the phone. It is definately not a new car. The radiator looks kind of beat up. I don't know much about men's hats, but the hat might not be period correct either. I agree with the radiator and think the leather seat looks more than a few years old. I see the woman's face, but there also appears to be a man's face in the fence. It is located behind the car to the right of the woman's face (as you are looking at the picture). I agree that the long depth of field suggests a modern small format camera, and the photo in general has a 50's-60's look to it. The woman in the tree is Ms Euthanasia Festerbludgeon of Winnemucca, NV. She's an old friend of my imaginary son, Mohammed Cuauhtemoc Oleandlena Jelf. Her hobby is hacking into online photos, so I'm not surprised to see her here. The phone she's using is a Western Electric Model 7734. That's a very rare model producing 30,000 microfoonads of impudence. My 14 has billed front fenders like what I see in this pic....but those rear fenders on my 14 are flat topped....not like the curved ones I see here. So...is this a 15? Jerry. My 14 has billed front fenders like what I see in this pic....but those rear fenders on my 14 are flat topped....not like the curved ones I see here. So...is this a 15 ? Jerry. I don't know if I should want to get into the face thing or not. Some say it is a sign of insanity. I had not noticed it, but once pointed out, yes, I clearly see the face in the windshield. But then, there are about a hundred faces on my bathroom floor. The "other" thing I had noticed was the brass steering gear case being painted black, as mentioned by Harold. Maybe the two things together give new meaning to the old phrase "see you in the funny papers"? Jerry D, The '12 torpedo roadster did have curved rear fenders, standard running boards and front fenders. The 1911 Torpedo roadster had curved rear and curved front fenders as well as shorter running boards and side aprons. The curve and sloping of the fenders on the '11 gives it an extremely sporty (almost speedster) look. Some good '12 torpedo photos on the following link. Steve J, Loved it. Enjoyed it very much. Merry Christmas to all! Missing the Stewart speedometer parts on the right front spindle and the cable. It does appear 50's and the paint seems long gone on the crank handle. Damm! Now I am seeing faces, Egads mother!! Looks like taken in 1950, that was my first thought when I looked when first posted. OK, this is weird ! After reading Harold's first post I scrolled back up and looked at the picture again. Didn't see any woman's face. Studied it in detail, still no face. Then I read down until I got to Steve's post. After reading Steve, I scrolled back to the photo again and there she was ! Clear as day. Now, either Steve's form of insanity is contagious over the internet or else he's messing with our brains. Either way, I'm now afraid to read any more of Steve's posts. It is interesting to see how far folks go in bashing water pumps.....Smile! I have been running a Texas T sealed water pump for 10 years with no failures. Is the spark plug wrench shown in picture used to beat the water pump? What makes you think the car has a water pump or did Royce tell you it did? Les, Royce may have sent a PM about a water pump? ?, but other wise he's not talking to us, he hasn't posted anything on the forum since 3rd Dec.
Maybe on a long holiday? Royce has been pretty active on the other forum. I went looking for the last E timer thread, couldn't find it with Key word search, so tried Royce's profile for his log in, I thought that might find it, no luck, did I miss something, thread gone? and Royce not logging in for the month? ?